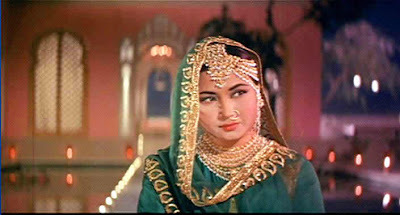 Click on the image of Meena Kumari, above, to link to the ‘Chalte Chalte‘ sequence in Pakeezah (music by by Ghulam Mohammed, lyrics by Majrooh Sultanpuri, Kaifi Azmi, Kamal Amrohi, Kaif Bhopali, sung by Lata Mangeshkar). One of the favourite films of Film Studies For Free‘s author is Kamal Amrohi‘s Pakeezah/Pure Heart (1971), a magnificent Hindi melodrama and one of the most accomplished and beautiful films in the transnational ‘courtesan with a heart of gold‘ film genre. As one of FSFF‘s favourite scholarly film weblogs is Michael J. Anderson‘s Tativille, you can possibly imagine how delighted it was to find that the centrepiece feature of Indian Auteur‘s third issue is Anderson‘s remarkable essay on Pakeezah. (IndianAuteur is an excellent online journal edited by Nitesh Rohit, Supriya Suri and others). What better way to celebrate the felicitous conjunction of all of these elements, then, or to encourage FSFF readers to explore them all, than a little list of Friday links to online and freely accessible studies touching on Pakeezah, Kamal Amrohi, Meena Kumari (pictured above) and the Hindi Courtesan Film. Thanks for the shout out and wonderful set of links, Catherine this is one of my favorite film too. Although, I’m scouting for a print of Daera that a no of Amorhi fans claim as his undisputed masterpiece. Oh my! I have a student writing a research paper on this very film right now. I don’t know whether or not I should tell her about this resource – it might be a bit overwhelming! Thanks Nitesh and Matthew. Matthew, your student should just read the first item – the essay by Michael Anderson. I was quite surprised, myself, by the amount of good, freely-available material on this film and genre. ‘Twas great fun to compile this list. Great, thanks Catherine! I’ll send it her way.